First floor rooms in the fantastic Western North Carolina mountains. 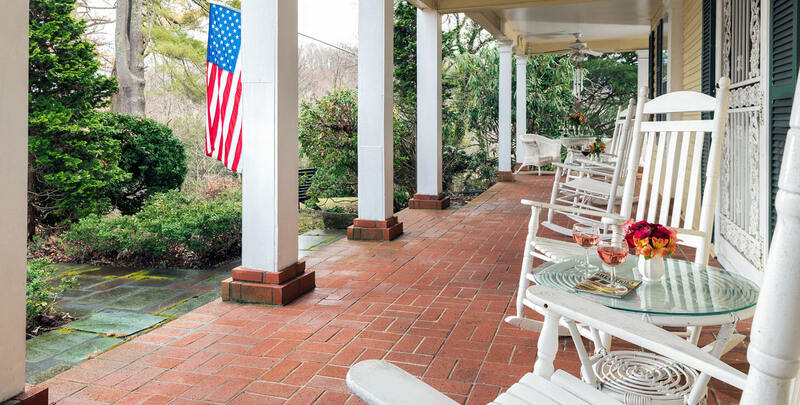 In the setting of our majestic Carolina mountains, guests of The Yellow House make memories when they travel by way of our first-floor accommodations. Our interior design will take you to places like the Netherlands (The Holland Room), Nantucket (S’Conset Suite), Southern Europe (The Vineyard Suite), and the English countryside (The Carriage House Suite). The Holland is an elegant and intimate suite rich with quaint, traditional Dutch features at The Yellow House Bed and Breakfast. Inspired by Dutch guests and their unique heritage, this suite offers its own private entrance with parking convenience, and a distinct separation from the main floor of the house. We invite you to relish in the subtle details of Dutch décor while also enjoying the Western Carolinas from your own private balcony. The Holland Room features a queen-size bed, gas fireplace, and a TV & DVD player. Delight in mountain, pond, and waterfall views from this suite. Our S’conset Suite with its fresh accents and crisp décor, whisks you away to a stay comparable to the seaside cottages of Nantucket. Located on the first floor of our Waynesville B&B, this roomy suite has rich oak floors, a large sitting area, wet bar, and a majestic dark cherry king four-poster bed. At night, the room glows from the light of the fire in the large Carolina fieldstone fireplace. End your day in the oversized soaking jacuzzi tub. Be refreshed by the relaxing feel of this coastal suite. The Vineyard Suite is spacious and private, offering the best Western North Carolina accommodations for your trip to the Smoky Mountains. Overlooking our lily pond, The Vineyard Suite boasts a cottage atmosphere reminiscent of Southern Europe. With its romantic ambiance and cozy charm, this room offers warm, sun-baked ceramic tile floors, a wet bar, jacuzzi whirlpool tub and a two sided fireplace trimmed with decorative tiles. The lace curtains, king size iron bed and low, wood-beamed ceiling are typical of the quaint architecture of southern France, Italy and Spain. French doors open to your private terrace where you can enjoy the fresh mountain air and bask in the beauty of our five lush acres and pond below. 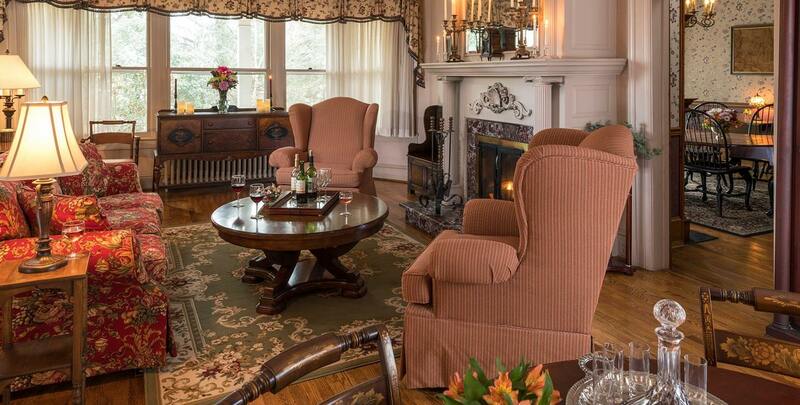 If you wish to stay in our Vineyard Suite, a complimentary bottle of red or white wine or cider is included – which makes this room perfect for a romantic getaway to North Carolina. Amenities also include a television and DVD player. A separate day bed means this suite comfortably accommodates up to three guests. 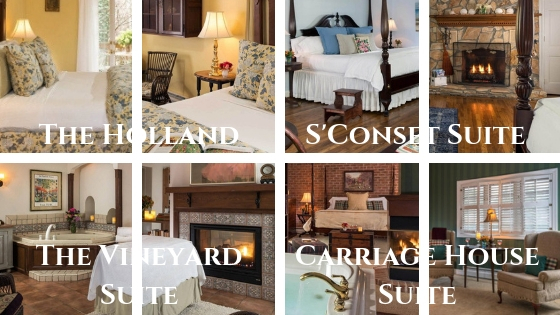 Escape to our luxurious Carriage House Suite of English country design. Warmth and coziness prevail in this green-walled suite trimmed with rich wood and brick. As you bathe in the whirlpool jacuzzi tub for two, and enjoy a lovely view of pond and mountains, you’ll be warmed by the glow of the peninsular fireplace. You can enjoy our homemade breakfast for an additional fee on the private balcony in the perfect beautiful, natural setting. The private entrance, high ceiling, wet bar, and king-sized bed make this an ideal setting for a special rendezvous to Waynesville. 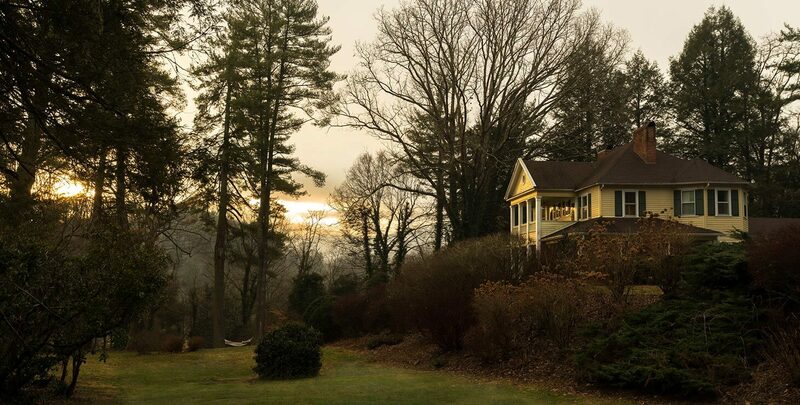 A visit to The Yellow House allows you to truly experience the luxuries of life. Our highest priority is the satisfaction of our guests. If there is something we can do to make your stay even more pleasurable, please let us know. If you are celebrating a specific occasion or planning on doing something really special (like proposing to your partner), we can make special arrangements so this a very memorable time in your lives together.